Kent McElvania retired after 32 years of service to the University in September 2017. A Waterloo, Iowa, native, he first served as the head of admissions and financial aid at UIU. In 2003, McElvania assumed the duties of assistant athletic director for compliance. Prior to his retirement, he also served as the University’s interim athletic director. Dressed head to toe in Peacock attire for almost every day he was employed with Upper Iowa University, it was of no real surprise when Kent McElvania was announced as Upper Iowa University’s 2017 Homecoming grand marshal. McElvania retired after 32 years of service to the University in September 2017. A Waterloo, Iowa, native, he first served as the head of admissions and financial aid at UIU. In 2003, McElvania assumed the duties of assistant athletic director for compliance. Prior to his retirement, he also served as the University’s interim athletic director. 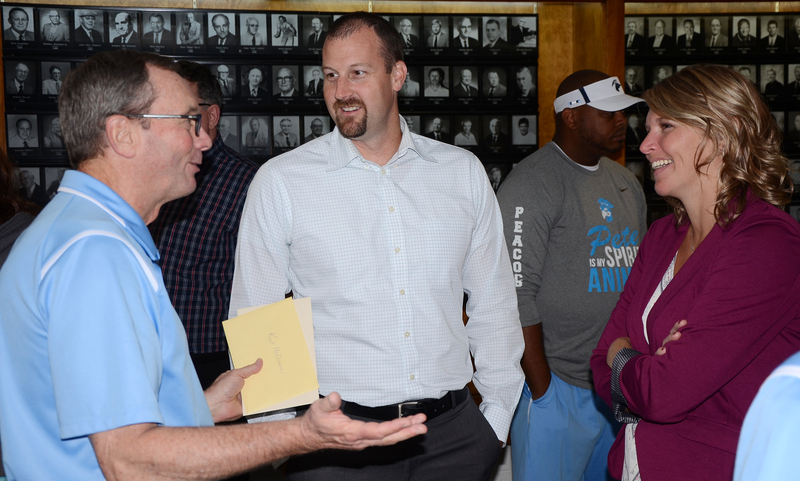 UIU Hall of Famer Bill “Pro” Prochaska (left) was among the alumni, faculty, staff and students to share their best wishes with Kent McElvania during his retirement party this past fall. Born and raised in Waterloo, Iowa, McElvania earned a bachelor’s degree in business administration and economics at Buena Vista University. While working in Buena Vista’s Admissions Office, McElvania met James R. Rocheleau, the person that would eventually lead him to Upper Iowa University. Rocheleau became the president of Upper Iowa University in 1984, and McElvania joined him a year later to become a member of the Peacock family. McElvania explained that the best thing about his job was working with UIU students, coaches and staff. He noted that on a normal day, he couldn’t walk across Campus without a string of students and coaches greeting him with smiles and kind words along the way. 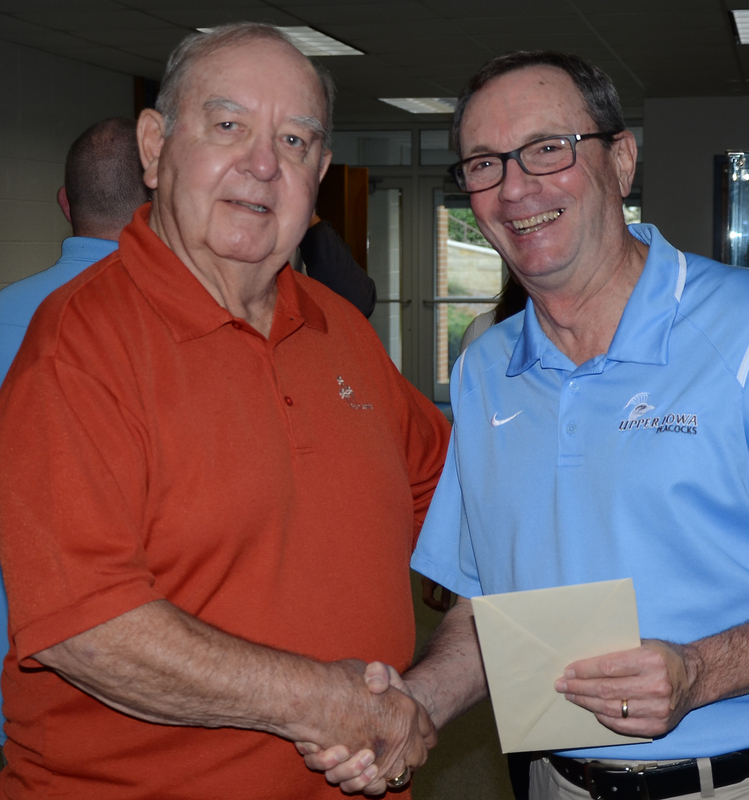 Although his main responsibility was to make sure students, coaches and staff obeyed the rules, McElvania’s personal priorities included the well-being of all students, making sure they were receiving the best education and coaching available. He witnessed how hard Peacock student-athletes worked in the classroom and with their respective teams. Kent McElvania (left) shares a few of his favorite UIU memories with Matt ’00 and Billie Jo Cowley ’08. One of the most cherished memories involved a member of the UIU men’s golf team and what the player did after his final golf match. For those who may wonder if McElvania had been reluctant to retire, he responds that he knew that the time was right for him to step away. With a smile beaming across his face, he explained his immediate plans are to spend more time with his wife, Lois, and family, including babysitting his three grandchildren. However, McElvania insists that Upper Iowa University will remain a large part of his life. It is undeniable that McElvania’s presence will be greatly missed on Campus. His love, passion and dedication to other people is a perfect example of a true Peacock.